This week, the Intake Digital Service launched Snapshot 1.0, the first release of CWS-CARES functionality which is now live and accessible by 22 county social workers. These users from across California represent Core Counties who are helping the state research, design and develop the new system to replace the legacy child welfare system. While Snapshot 1.0 is a limited initial release, it is a significant technical achievement that demonstrates the viability of the CWDS cloud infrastructure, web application architecture, and user-centered design methodology. CWDS priorities include expanding Snapshot and providing access to a larger set of users toward an eventual statewide deployment. Consistent with Agile methodologies to refine and improve the way software is developed, the project is adding Program Increment 5.7 to its regular development cycle to spend two weeks examining ways to optimize performance. For example, CWDS underwent the initial stages of regrouping development teams, called Team Optimization, which will allow greater flexibility to move resources across digital teams to spike development according to shifting priorities. 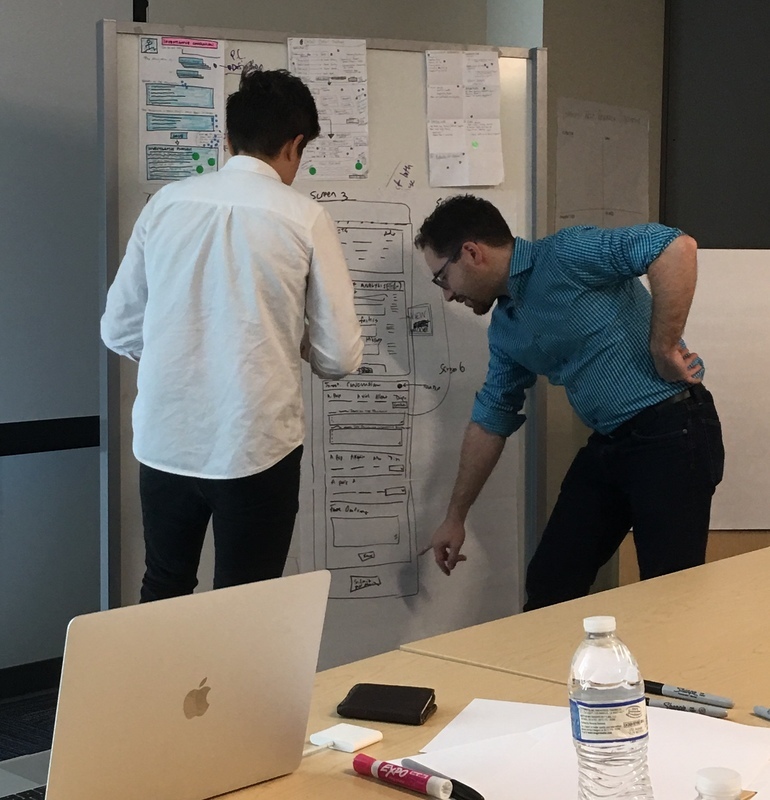 Another refinement includes centralizing the project’s research and design team members across the digital services to broaden their contributions and reduce duplicative work. This will enable them to get ahead of the development teams and streamline the product pipeline. The project has begun creation of a new collective referred to as the CWDS Research + Design Studio. 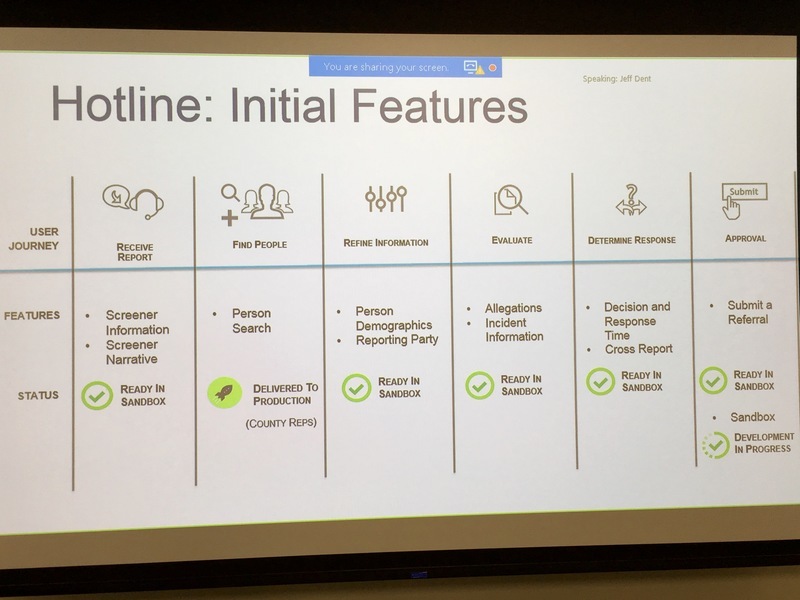 Core County representatives will continue to provide invaluable feedback as user-centered design remains the main tenant guiding development toward a modern set of tools aimed at protecting California’s children. Child Welfare Digital Services (CWDS) today announced the name, CWS-CARES, for the new system under development to replace the legacy Child Welfare System (CWS/CMS). The team also unveiled a Project Roadmap of upcoming features, including its first statewide release of a search tool called Snapshot. Working in partnership with the California Welfare Directors Association (CWDA), the project formerly referred to as New System is now called Child Welfare Services - California Automated Response and Engagement System (CWS-CARES). The process to name the new system included a collaborative effort with child welfare directors and staff. Project stakeholders are confident that the new name captures what the new system will deliver to users across the state. In addition, the project revealed a Project Roadmap that details digital service functionality roll out dates for Intake, CALS (Licensing) and Case Management. The Roadmap covers a 15-month window of project releases, starting in July 2017 through September 2018 and provides a logical model illustrating general timeframes, which may shift due to agile development priorities. Snapshot is the first digital service tool to be rolled out as a part of the Project Roadmap. 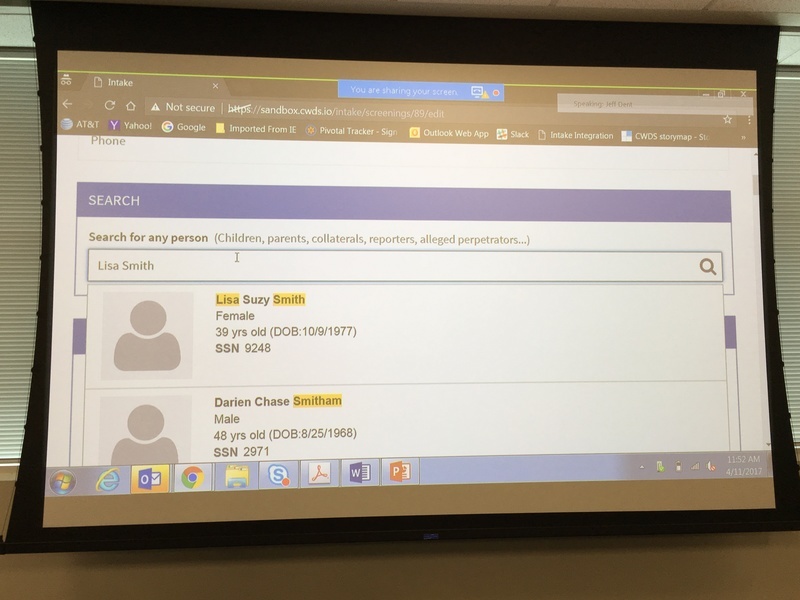 Scheduled to go live early next year, Snapshot allows staff to search for one or more persons and view the history of their involvement with child welfare, including referrals and cases, in a fraction of the time that it currently takes to do the same work in CWS/CMS. Specifically, Snapshot gives staff the ability to search for people across CWS/CMS from a single field, see each person’s current contact information and demographics, and view an at-a-glance summary of their CWS history. The tool also includes a way to easily copy and paste key information which will greatly enhance workflow for staff. The CWS-CARES Implementation Team is scheduled to provide a number of services for counties to prepare for Snapshot. 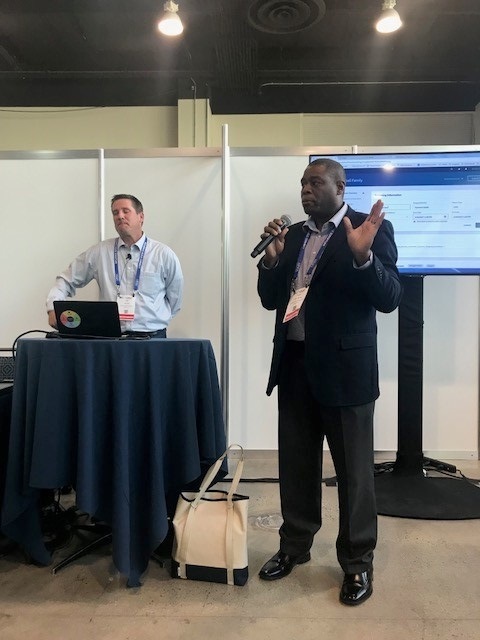 This week, CWDS Digital Services Director Kevin Gaines and Intake Digital Service Product Owner Jeff Dent (pictured below) gave a demonstration to share progress on the project’s Intake Digital Service software development at the ISM Conference in Washington D.C. The conference brings together state and local IT innovators, federal partners, and industry experts to promote solutions that support the mission and vision of Health and Human Services programs nationwide. 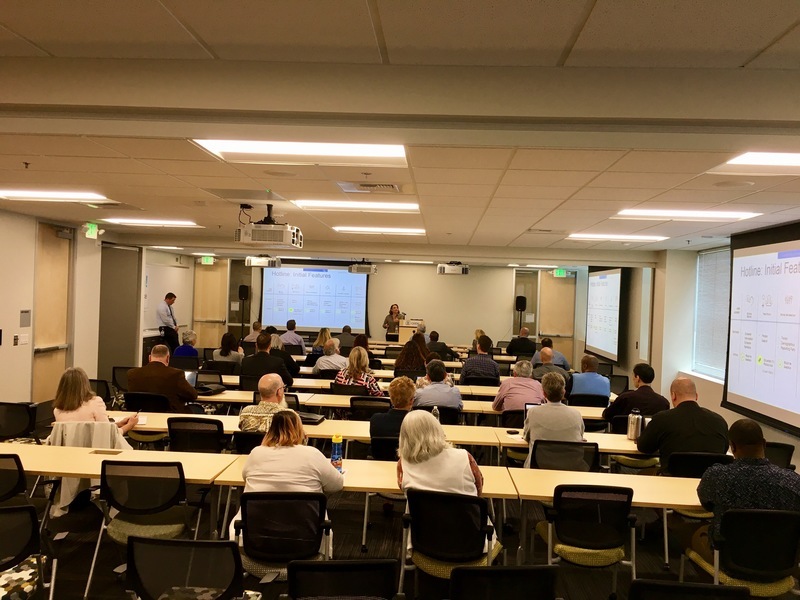 The Digital Services Intake team held a two-day county workshop with Los Angeles, Ventura, Butte, Fresno and Yolo counties here in Sacramento. One of the primary goals of the workshop was to develop and mock up the investigations conclusion page and the investigations dashboard for CWS-NS. The team spent the morning story boarding and working out potential page views for the investigations conclusion page. Then the team broke into two groups with one developing page prototypes and the other writing real world scenarios to test against the prototypes. The two groups later reconvened and walked through the scenario using mocked up screens. This lead to some very valuable discussion between the teams and the ability to modify and improve the proposed pages on the spot. This design-build process allows counties and the project team to work collaboratively on real world scenarios that meet the needs of social workers and supervisors based on how they work today. This process also lets us identify where there are duplications of effort and reduce redundancies whenever possible. Please click here to view the team's presentation materials. On September 11, our Intake Digital Services Team Manager, Wendy Christian and Product Owner, Jeff Dent provided an overview of their team’s efforts to date. They also presented future enhancements and functionality scheduled for upcoming releases. Currently, we are finishing the development and testing of the child welfare history snapshot and hotline functionality. In the next development phase, we will be adding contacts and interfaces with Smarty Streets functionality. Contacts will be used primarily by CPS workers for case referrals and the Smarty Streets interfaces will allow social workers to check addresses and map out their day in a geographically user-friendly way. The goal is to provide tools that are designed so workers only need to enter data once and screens only the data worker’s actually need. Once these products are developed they will go out to our Core County team members for further review and testing. The Core County users validate the design, direction and functionality of the modules and provide invaluable feedback before further development continues. This process ensures that the software that is ultimately deployed actually meets the needs of the users and saves time and money during the development cycle. 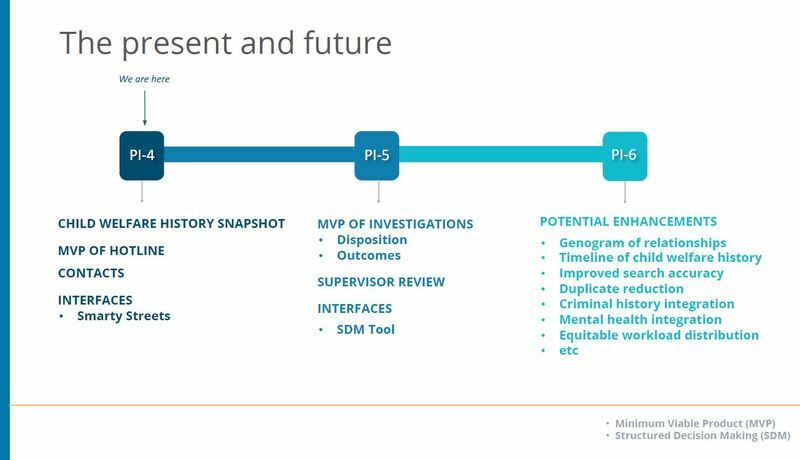 Future development cycles will feature investigations, including dispositions and outcomes, supervisory review and interfaces to our SDM Structured Decision Making (SDM) risk and safety assessments tools. Other future potential enhancements will provide more user-friendly tools to social workers like: genogram of relationships; timeline of child welfare history; improved search accuracy; duplicate reduction; criminal history integration; mental health integration; and equitable workload distribution among other improvements currently under discussion. The chart below provides upcoming features over the next three Program Increments (PIs), which are three month phases that consist of 6 two-week sprints using agile methodologies. PI-6 will conclude in Spring 2018. For more details, see the entire September 11,2017 solution demo here. 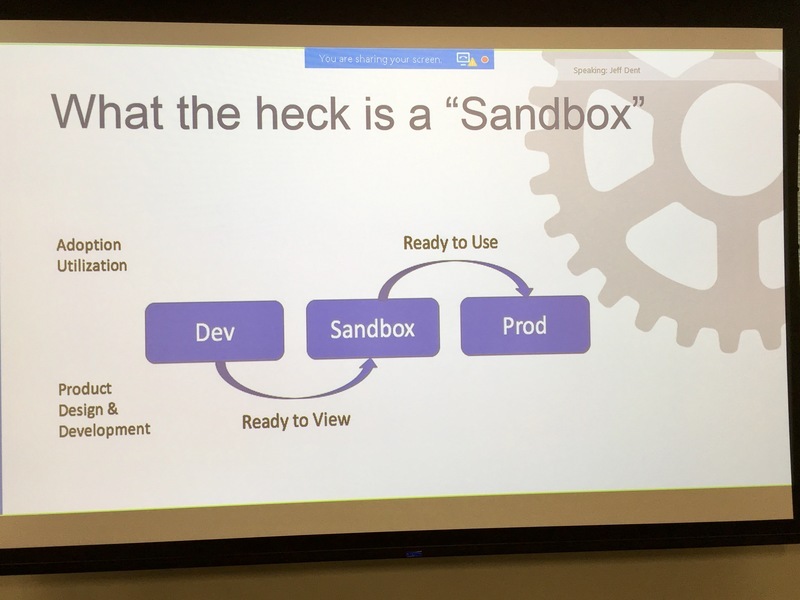 At today’s Quarterly Stakeholder Forum, Intake Digital Service Manager Wendy Christian and Intake Product Owner Jeff Dent gave a demonstration of the newly created “sandbox” that will help voluntary county users better understand new functionality of the intake module, as developers and designers continue to iterate on versions of the new system. The standalone sandbox uses test data to give users a sense of workflow and usability, without any security risks. The Intake Module covers the spectrum of Emergency Response – from the time a report of child abuse comes into the hotline through the work done by a CPS social worker to investigate these allegations of child abuse and neglect. Key slides from the presentation are below, stay tuned for more details. The video archive of today’s session will be posted soon.